UK home sales are up 9.7% year on year in the period between December and January (seasonally adjusted HMRC). The volume of mortgage approvals – a leading indicator of completed house sales – increased by 5% between December and January to 74,600; the highest level since January 2014 (Bank of England seasonally adjusted figures). It is expected that upcoming stamp duty changes on second homes coming into effect in April have brought forward purchases and it is likely that we will see purchases drop back in spring/ summer. New property listings are rising. Rightmove report a 5% uplift in new properties coming to market compared with the same time last year. More choice for first-time buyers as the number of properties with two bedrooms or fewer coming onto the market is up 10% year on year. 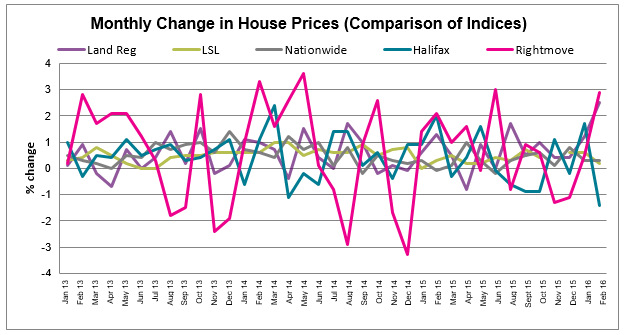 Halifax research indicates that the increase in average house prices has exceeded average employee net earnings in more than a quarter of local authority districts in the UK over the past two years. 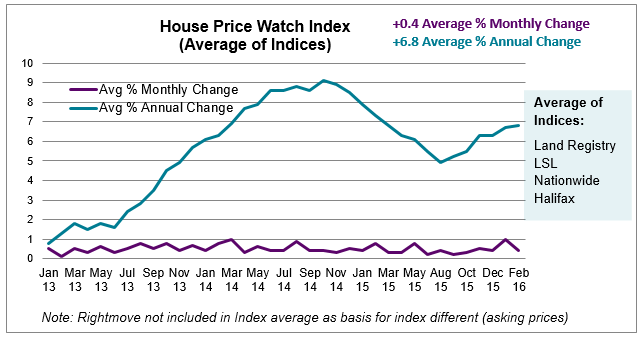 As house price increases exceed wage growth, it is likely that affordability will begin to curb demand; later in 2016. Regional Land Registry data from January indicates that average monthly house prices have risen significantly in a number of regions: up 3.7% in Wales, up 2.8% in London and up 2.2% in the South East. Rightmove report that the regions with the most significant rise in property listings with two bedrooms or fewer include: London, East, South East, South West, West Midlands and Yorkshire & Humber. 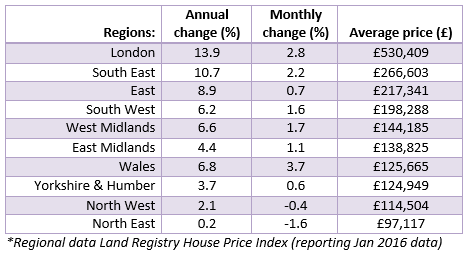 If the trend continues, it could help to moderate house price rises in these regions.